Beautyworld Middle East 2018 completed a triumphal three-day run at the Dubai International Convention and Exhibition Centre, setting new highs in exhibitor participation as well as exhibition space covered in the process. The region's premium international trade and networking event for beauty products, hair, fragrances and wellbeing featured a record breaking 1,736 exhibitors from 62 countries, and drew 36,394 trade visitors and beauty professionals from 139 countries. The numbers confirm the tremendous cross-regional reach and pulling power of Beautyworld, and underlines the tremendous potential that exists in the Middle East beauty market, which is one of the highest spending in the world. As has been customary over the years, Beautyworld Middle East 2018 once again was a glittering, buzzing and high-profile event, with a large section of the regional beauty industry, trade buyers and key decision makers from across the region, leading manufacturers and suppliers, leading beauty and wellbeing experts and thought leaders, as well as a majority of the world's leading brands gathered together for the region's premier beauty and wellbeing trade and networking extravaganza. "The remarkable growth in Beautyworld Middle East, the increasing attractiveness of the show as a preferred business promoting platform for exhibitors from across the region and its neighbourhood and the continued interest in the high-spending region by leading international beauty and wellbeing brands, points to the growing importance of the Mdidle East as a major beauty market," said Ahmed Pauwels, CEO of Messe Frankfurt Middle East, organiser of Beautyworld Middle East. "In addition to being the preferred launch platform for beauty brands to launch new products into the region, the event continues to attract an unmatched quality of trade visitors to its show floor, which is one of the exhibition's major pulling points," Pauwels added. Spanning 61,000sqm at the Dubai International Convention and Exhibition, Beautyworld Middle East 2018 featured 1,736 exhibitors from 62 countries. The international line-up included .24 Country Pavilions that included first-timers Palestine, Peru and Russia. 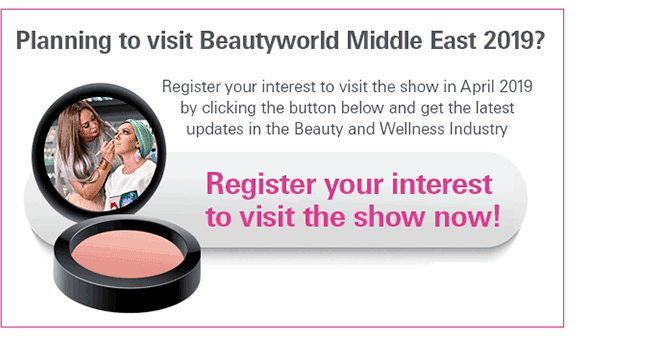 The incredible reach of Beautyworld Middle East across the region was also underlined by exhibitors choosing the show to launch a 100 new products into the regional market for the first time. The show also featured the debut of the Natural & Organic section which featured more than 60 exhibitors taking the plunge and showcasing their latest products and taking up 700sqm of exhibition space. Early feedback from exhibitors across the key product groups represented at Beautyworld Middle East - Hair, Nails & Salon Supplies, Cosmetics & Skincare, Machinery, Packaging, Raw Materials & Contract Manufacturing, Fragrance Compounds & Finished Fragrances, and Personal Care & Hygiene - proved extremely positive, with most appreciating the excellent quality of trade visitors and impressed by the footfall generated at the show as well as the number of business leads created. Carlo Galli, General Manager of Marchesini Group from Italy said: "Beautyworld Middle East is very important for the cosmetic industry and it is a major show for us. We handle the whole of Middle East directly from Dubai because we have a platform here and we route all our regional business through this country. The Middle East market is very promising, though we can say that we are just at the starting point.". Participating with a view to increase visibility for their UV gel range, Akmana Hoes, CEO of CNC International said: "We are manufacturers of UV gels and we are looking for gateway to establish our presence in the Middle East and Beautyworld Middle East is a perfect opportunity to do so. It is the main platform to start your business within the Middle East and talk to professionals in the industry and meet others that are in our field. The show attracts the who's who of the beauty trade. We are developing our brand, we haven’t started out in the Middle East, but we do get a lot of requests from this market. It’s our first time in this show and we are seeking out opportunities." Another exhibitor all praise for the show's ability to bring in the right kind of trade visitors and industry professionals was Dominique Bortoloni, Area Manager GCC for Robertet. "It is a very important exhibition, especially for people working in the fragrance industry. Dubai is in the centre of a large area so it’s important for us to be here in Beautyworld to meet many people from different countries all at the same place. The Middle East market has its ups and downs, but it is still essential for us to cover this market." Meanwhile, Brunelli Gomes, Evaluator for Givaudan spoke about the networking aspect of the show. "Beautyworld is really important to us because we meet our existing clients here and they can see what we are showcasing as well as access the latest launches and trends. The show attracts most of those influential in the trade, who make the buying decions. It is also important because we are able to emphasise our presence here for both our existing clients and future prospects. It is important to be on the same platform as our competition so we can show what we can bring as a brand." The show also saw robust participation from UAE-based exhibitors, with 199 of them participating. Headlining the UAE contingent was Nazih Group, one of the Middle East and North Africa’s (MENA) largest distributors and manufacturers of beauty products, haircare, and cosmetics. The regional powerhouse this year again presented Centre Stage by Nazih Group, a three-day educational showcase highlighting the latest trends and developments in the beauty industry. Other notable highlights at this year's Beautyworld Middle East were: Quintessence – the art of Perfume; Nail It! by Artistic Nail Design & OPI; and the Battle of the Barbers.New this year is Blend’It, and the Advanced Aesthetic Therapist Conference and Workshop. Dedicated to the world of rare and niche fragrances, Quintessence is one particular feature that continues to grow in popularity, which this year featured 25 select brands. Luxe House, a distributor of premium beauty products throughout the Middle East, with five brands under their banner: Tom Daxon, Nishane, Signature Fragrances London, Teaology, and WHEN, was extremely pleased with the outcome of their participation. Doaa Tahboub, Co-Founder and Marketing Director of Luxe House, said: "Beautyworld Middle East is an extremely exciting event that we look forward to participate each year. It gives a huge opportunity to be with the ecosystem that completes our existence in what we do. As distributors, it gives us a platform to be present with our suppliers, guests from other markets and different countries, customers who are eager to find out what novelties we are presenting this year. It also allows us make pull marketing by giving us chance to reach all this audience in different scattered places. So this platform is definitely a very efficient and optimal to way to meet everyone under one roof. "The brands that we represent, such as Nishane and Signature from London and others are all what you consider the next wave of strongly emerging niche brands. They are trendy, they are hep, they are also exquisite and qualitative in nature. And an audience with that kind of taste is also developing who is very thirsty to be very unique in their selection. So we bring that to the customers and we are seeing a lot of interest and positive performance. We are very happy to announce that we have opened a multi-brand boutique, Perfumery and Co., in Dubai Mall. A lot of interest is noticeable from prospective clients to check out these brands," Tahboub added.